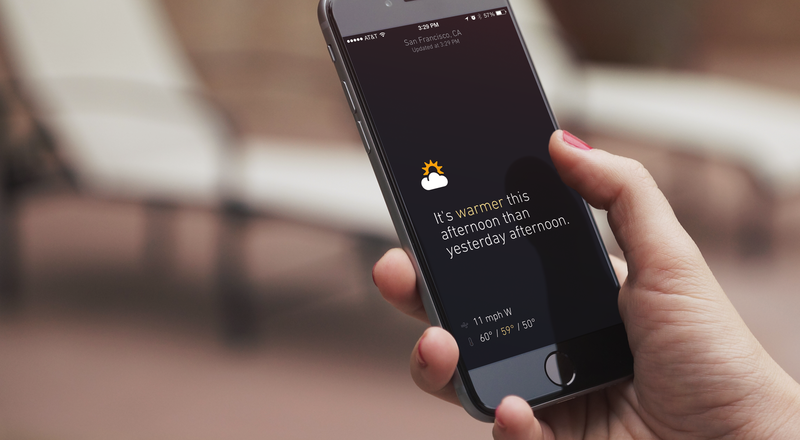 A simple iOS app that makes weather forecasts accessible to humans. 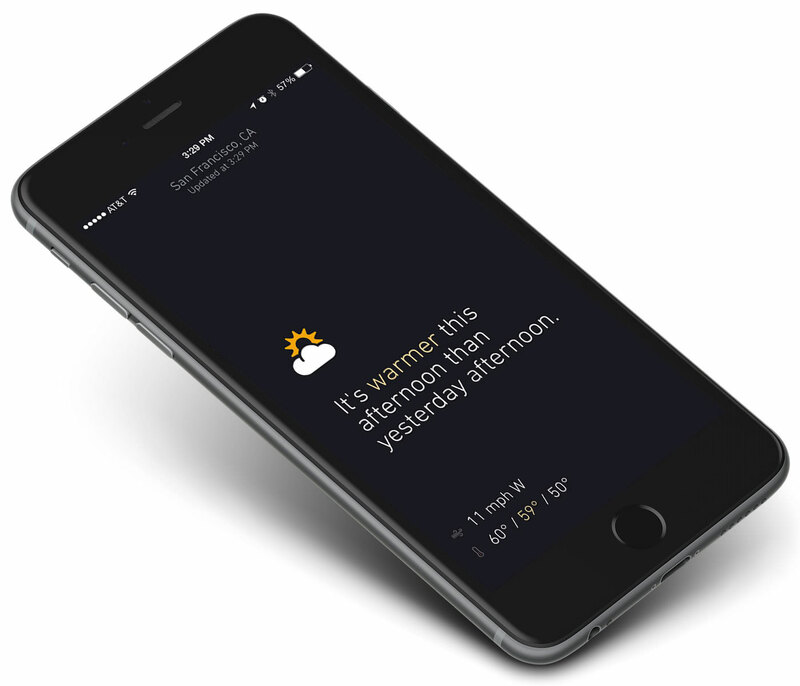 Tropos is a simple weather app for the iPhone that has one goal: to make current weather information and forecasts accessible to humans. Most weather apps throw a lot of information at you but that doesn’t answer the question of “What does it feel like outside?”. Tropos tries to answer this by relating the current conditions to what they were at the same time the day before. 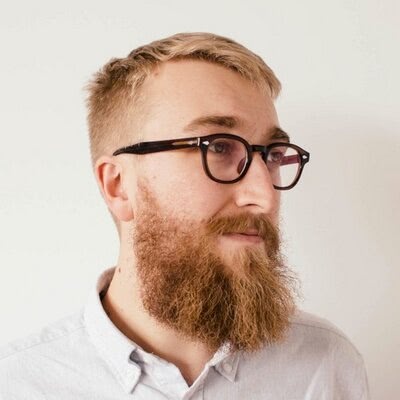 The app, built entirely in ReactiveCocoa, was designed and built over the course of six weeks by designers and developers at thoughtbot and can be found in the App Store. 1 designer and 2 developers worked closely together for a month and a half. They wanted something minimal that used color as the primary way to communicate a change in temperature. They weren’t trying to be the Forecast or Yahoo weather app. They had strong initial designs and hypotheses of what would work and quickly iterated into a working first build. In what was a pretty informal but effective process, the app was distributed to co-workers, friends, and family and tested and played with internally, driving many Slack conversations. One thing became really clear: the novelty of knowing today’s weather versus yesterday’s was indeed important context, but people were still resorting to other apps to get the forecast for the next several days. People wanted a more well-rounded feature-set so they didn’t need to consult more than one app. The initial design featured four main colors relating directly to the temperature: red for hotter, orange for warmer, blue for colder, and light blue for cooler. In response to user feedback, the team introduced the concept of high and low temperatures for a day. In doing so, they then realized they could create another pattern; every degree of temperature changed the hue of the respective color a slight degree darker or lighter. Gestures allow the forecast to be hidden or shown. Even though a forecast feature wasn’t originally planned, feedback from users showed that showing the forecast would provide a large value to the consumer. 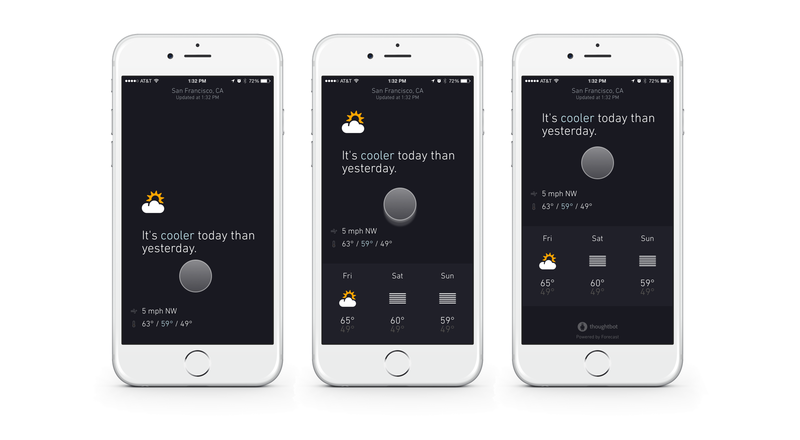 The team wanted a “skinny” forecast, and created basic gestures to allow for hiding or showing that forecast intelligently. The team also wanted to add value through small touches, like the colorful pull to refresh animation. Elements like this add a delightful “wow” factor, and incorporating the branding colors kept the style of the app consistent and fun. On launch day, we swapped the email capture form with the “Download on the App Store” button and emailed the people who signed up in the pre-launch. Check it out for yourself in the App Store. The marketing site and build up to Tropos’ launch were highly considered. We generated a Middleman app with thoughtbot’s Proteus framework and we drove traffic to the site before launch to capture email addresses. When the app launched, we emailed the mailing list.